I very much hope you do start making Caribbean type front-loading monocoque case divers, and in a variety of sizes and styles (including pure classic and bezel-less, etc. 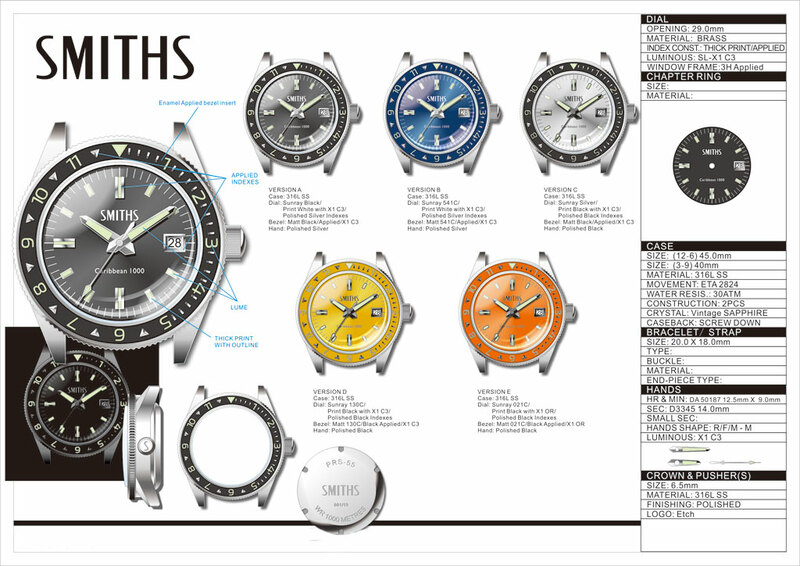 ), as I personally think that the Caribbean's technological case design is by far the very best ever developed for divers (and perhaps tool watches in general). I once read somebody on the net who said that the Jenny Caribbean Triple-Safe, in its case design, is "what the Rolex SeaDweller should have been". That makes perfect sense to me and I'd add that it seems a watch case design genius in its simplicity and, I'd think, if properly done, as potentially strong or nearly so against tremendous external pressure compared to even the heavily hyped "RingLock" case design of the much more recent Rolex “DeepSea” SeaDweller. At the same time, though, I think that Rolex, to their lasting credit, long ago developed the very best tool watch crown/crown tube design ever devised with their TripLock OysterCrown, and putting it together with the front loading screw-down crystal Caribbean Triple-Safe mono-bloc case design would be, to me, state-of-the-art watch engineering perfection regardless of the age and venerability of both these famous technological designs. A question would arise regarding a pairing of these two inventions given that the OysterCrown has a telescoping one-piece type stem, but it is still completely compatible with the front loading Caribbean case if a crown stem release access hole is simply but discreetly drilled through the periphery of the dial and, perhaps, though technically unnecessary, hidden under a chapter ring of sorts (as with Seiko's own MM300 take on the Caribbean design). I'd also think you'd be legally unhampered in any way by either Jenny or Rolex in the use of either techno design above given that their respective patent rights must have long since expired. I'd guess that naming or labeling them as such might be another matter, though, due any lingering copyright protections these companies may still retain. By the way, Eddie, given the oversize concerns you've mentioned with the 1000m, maybe you could consider going with the less famous, but probably much more real-world practical Jenny Caribbean Triple-Safe 400m case size instead. I know that I would personally much prefer it and gladly trade what is perhaps the overkill depth rating of the 1000 for the, I think, far more daily useful compactness of the 400. If anybody might think I'm just newly enthusiastic about the above, I've never forgotten posting on the subject over 5 years ago regarding the possible viability of a very comprehensively specificationed and truly purpose-built TF Smiths Caribbean, and I've been hoping ever since that you might consider such a project some day. In fact, Eddie, I think that if you ever decided to go at it all out with no real compromise like you did with your, I think, peerless and so incredibly beautifully done Roland K. manufactured original true-to-vintage specification version of the TF Smiths Military 36mm PRS-29A that, in effect, recreated, both inside and out, the iconic 4701 Smiths W10 of the late 1960's, the results of a Caribbean w/TripLock technology based TF watch project could easily turn out to be genuinely incredible as well. 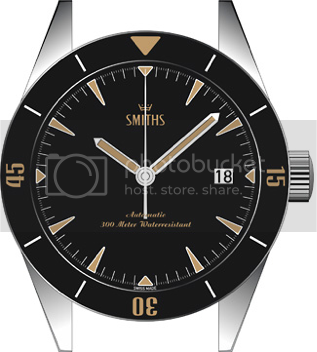 For myself, I think that the potential for such a combining and integration of technology would be so good, great really, that a TF Smiths Caribbean Triple-Safe 400 diver with something like the classic (1960's Jaeger LaCoultre “Compressor” style?) dial pattern shown in the attached link below, and incorporating the highest “golden-era” vintage tool watch specs also mentioned in that post (i.e. full Faraday cage and OysterCrown specification crown & screwed tube) with added details like premium “best-of-both-worlds” self-threaded screwed lug bars, etc., etc., could technically and otherwise ultimately prove to be without peer as an all-around heavy-duty but still comfortably compact diver class superwatch pretty much able to deal with anything one might put it to, including going with formal wear in a pinch. Last edited by Rollon; 26th September 2018 at 18:25. This thread I've started hasn't exactly invited an onslaught of outside comment, so, though a bit embarrassed to do it, I'll put up “a little” more, if for no other reason than it's kind of fun to post. I thought I'd explain IN DETAIL a few(!) of the specifics as to just why I'd so much like to see a circa 1963 conservatively classic in form front-loading Jenny “Caribbean” mono-bloc 316L or 904 steel case loaded with a full soft iron antimagnetic “Faraday Cage" that is lined inside in lieu of a formal movement holder with a simple of manufacture and [even in freezing and below temperatures] appropriately soft yet sturdy while thin enough synthetic material rear and side impact buffering inner floor and walling that abuts forward to the inside rear periphery of the dial and forms a "rubber room" of sorts that closely wraps and cradles from shock the movement that is capped by an edge-drilled crown stem release port equipped 60s golden era aesthetic matte lacquered and lumed soft iron dial while a strict generic thread specification Rolex “TripLock” pattern crown tube is screwed to the side of the case at 4:30 or 3 and fitted with its generic spec OysterCrown after the strap lugs are run through with well Loc-Tite'd or miniature NyLoc'd self-thread collet screwbars before the heavy-duty notched and threaded retaining ring placed at the peripheral “flange” of the mil-spec acrylic, or scratch resistant dress watch sapphire, or even shatter-resistant / aerospace grade - perhaps “best-of-both-worlds” borosilicate glass, or whatever composition of choice crystal is screwed down onto the solid steel of the case's integral crystal seat upon which sits a heavy and fully interceding flat synthetic gasket that also slightly overhangs its seat to gently hold in place, buffer, and check the forward thrust of a spacing metal chapter ring that in turn the dial and the movement attached to it depend on to stay in their place and benefit from the transferred buffering effect of the cushioning overhang of the crystal gasket to complete the protection of the watch's mechanism against hard knocks as the now geodesic-like whole can then hopefully become “more than the sum of its parts” by coronation with a durably fonted and pipped traditional in appearance state-of-the-art lockable-set type ratcheted timing bezel, or optionally NOT in order to keep things plain bezel simple, sleek of form, friendly-of-cuff, and “tougher in the rough”. Having just written this above atrocity of the English language I call a “paragraph sentence”, it does appear mostly self-explanatory, so I think it best to pretty much leave it at that for now before being banned from the forum for committing gross, grammerless, and boring verbosity. Because its case needs neither a separate back piece, or the rather complicated helium escape valve required by other gas-dive capable case designs lacking a screw-down crystal for resistance to negative pressure, the above theoretical version of a Caribbean construction mil/dive/tool watch has only two points of opening that require sealing against water and whatnot, at the crystal and at the crown. With both of these, the sealing is accomplished by tightly sandwiching a “squishable” synthetic seal between two opposing parts without those two opposing parts, by design, ever contacting each other so that each opposing part can only ever bottom out on the synthetic seal itself as long as the seal remains in place. This allows for the sealing of the above design casing and crown to perpetually compensate for the inevitable wear and compaction of the synthetic sealing material over time, use, and disassembly, by simply just properly reassembling and periodically tightening down the crystal retaining ring as might be needed and/or the crown as you go about your daily use of the watch. The Russian Vostok Amphibean design famously and effectively uses this directly analogous sealing principle both at the retaining-ring secured domed steel caseback and at the single cap top gasketed crown that bears tightly upon the top surface of the crown tube each time it is properly battened down. Rolex make donuts? Is there a list for the more desirable ones? There must be otherwise why would they seal them? Agreed... I love the idea but don’t have the vocabulary to add anything.. hence all I understood was something about Rolex donuts. Thank you each for your kind comments. Last edited by Rollon; 7th October 2018 at 00:56. I recall one of your earlier posts ( years back) which left me slightly breathless as well. You put more thought into this than I suspect whole government departments manage with matters of national importance..! Well thank you very much, you are very kind to say that. I can't say I've ever been compared to government bureaucracy before, but as long as I come out as favourable in contrast, I'm very good with it (my first thought was that you meant I was like government bureaucracy on steroids or something, but then I thought, nah, nah, he didn't mean that, ........ uhm, ..... you didn't mean that, ...... uh, ... right ................................?? But if there's a TF possibility l'd rather hold off any purchase. I personally think the basic technological construction of these front-loading Jenny "Caribbean" mono-blocs is the very best ever yet devised for a comprehensively purpose-built wristwatch, Eddie, and very glad you're considering offering it in the TF line. I don't know if you read everything put up in the first two posts of this thread, but I tried to explain up there why I personally think watches so constructed are so good, and it would honestly be bizarre to me to find I was objectively wrong on that. I love the look of that just as it is, though I think the hand style might be tweeked a bit without damage, maybe (only maybe); would definitely prefer a black background date wheel to better go unnoticed until needed; and I'd for myself also like to see a version with the front of the case just CNC machined to a classic plain bare solid bezel (like a vintage style Panerai diver is) but with the (I think technologically beautiful) notched and threaded heavy-duty steel retaining ring encircling the flanged crystal it keeps so well secured and water-tite (going bezel-less like that for this might be an aesthetic only I could love, but I don't know). Looks lovely in blue......and please a tad bigger...42mm across? Equisite handset and the bezel is perfect, great job. And Eddie knocks another one out of the park. I really like all the colours, and am normally a blue person, but the orange really appeals to me. I wasn't expecting a silver either, but it looks lovely. Enamel applied bezel insert? I am not sure I understand, does this mean the colur, lume and applied markers are to the back of enamel? Or is the colour the enamel, on the back of another material? 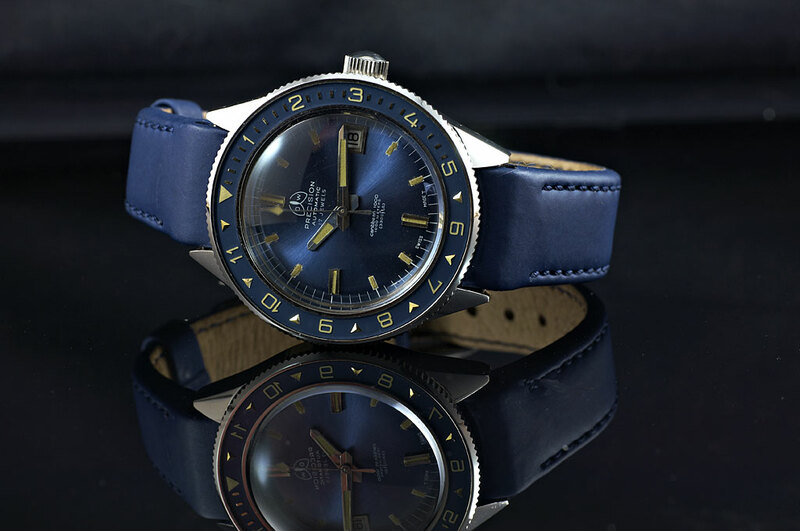 Love the polished markers in the bezel, and the polished and folded hands look great. Any news on the how deep the case will be, I couldn't find that dimension. Looking fantastic, any chance of getting a beads of rice bracelet? Also, what's a reasonable timeframe for delivery? Wow, I mean really wow, that looks absolutely superb particularly in the blue. Dead keen on the blue. Last edited by redhed18; 7th December 2018 at 21:11. I assume the 1000 is feet not metres (as per previous discussion of case depth), so the case back script would need to change. It will be 1000 metres. I might come to regret it but I like the look of the yellow. Last edited by Groundrush; 8th December 2018 at 19:11. Very nice indeed. I think I like the black dial the most. Ideal size, no bigger please. What movement is going into it? What movement is going into it? Last edited by andy armitage; 9th December 2018 at 11:27. Blue 40mm for me thanks. I am in for one of these, blue or yellow they both look fantastic. I'm liking the look of that silver dial. Looks like it has sufficient contrast between dial and hands (often not the case). Yup, I'd agree on the branding, prefer Precista. Think I'd still get one despite reservations about the smallish size because it has so many appealing style cues. I agree that's why I like them so I wouldn't want it thinner. My SKX007 measures 13.25mm so 14.5mm isn't that outrageous. It is a 1000m dive watch after all. I've got a Certina Super PH1000M from the 70's which is 18mm thick. Pretty much perfect, I'm going to end up with more than one of these I think. Wanted an original for years.